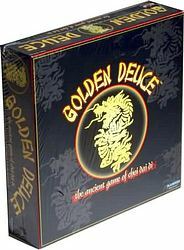 Golden Deuce steps up this classic trick-taking climbing game that requires cunning wit and strategy by changing the odds with a unique 60-card deck, while providing board game action for a new twist on this addictive game! Be the first player to lay down all your cards, and win points from other players in the card game round. Then, maneuver any of your pawns the number of spaces to match the number of points that you earned. But beware! Moving too many pawns too quickly may leave you unable to collect the points you deserve! With special spaces to send you back, move you forward, or 'warp' your pawn to another space on the board, it’s a race to the finish to win the game! game board, 60 card deck of Golden Deuce playing cards, Rule & Card Ranking reference cards, 4 gem stone playing pieces for each player, and Easy to understand Player’s Instructions for quick-start game play.